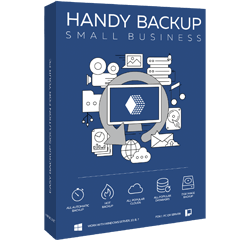 Handy Backup™ Small Server is the in-one-package, easy-to-use software designed for Windows. It provides the unified backup solution for small to medium business, keeping files, folders, databases, web content and other business data. Software can automatically backup data of MS SQL, MySQL, PostgreSQL, Oracle and any other database, as well as the message base of the MS Exchange or personal emails from IMAP servers. As required for data backup solutions for small business, program copy any type of data without stopping other processes using these data, saving both the time and efforts from unnecessary pauses. 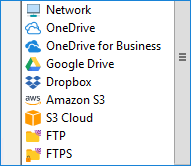 You can back up your web apps and web content freely with Handy Backup (e.g., make a copy or a mirror for a company website), using FTP/SFTP/FTPS protocols, or backup server data locally. Backup and restore all type of user and server data directly “out of the box, without a need for any further upgrades! The Small Business solution contains all available plug-ins, features and options. Handy Backup has a capability to save the perfect image of any server, physical or virtual. It supports any type of virtual server engine, including Hyper-V, VirtualBox and VMware. Small Business backup software can store data at any of popular cloud services such as Amazon S3, Google Drive, OwnCloud, Backblaze, Dropbox, OneDrive and OneDrive for Business. Small business backup tasks can be tuned flexibly by scheduling, as well as supporting full, incremental and differential backup, rotating backup versions and other options. Any modern external storage, be it HDD, SSD or NAS, is fully compatible with Handy Backup. 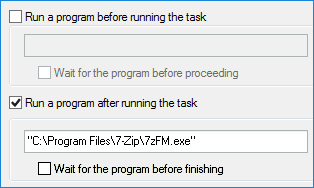 You can even start a task automatically when you are plugging a USB unit related to a task into your machine! License for the major version of Handy Backup is last for the product lifetime, as well as all minor upgrades and free tech support for customers, we will answer quickly for any your request! You can perform small business data backup for files, folders, databases and disk images backup using a single program for all of it. There is no more cost-effective solution for such a functionality! The program preserves native format of any data during backup (unless compression or encryption specified by a user). This allows using these data directly with related tools, such as Windows Explorer. You can restore data automatically by creating a recovery task, including restoring backups manually moved to other place, speed up the restoration. Time stamps backup and an option for restoring to another place add greatly to comfortable restore. Algorithms used by Handy Backup are always being the top of the SMB backup solutions on the IT market, providing the utmost speed, comfort and reliability available for a day. Purchasing a copy of Handy Backup, you are also get the lifetime technical support, always ready to help you in any situation. License for the major version of Handy Backup is last for the product lifetime. The small business backup solution Handy Backup Small Server is designed for MS Windows 10/8/7/Vista, or Windows Server 2016/2012(R2)/2008(R2). No special hardware is required. "Have been running Handy Backup on two servers, using two packages for MS SQL and SFTP backup. A third sever has now been added and I finally bought Small Server edition for all of them. Given the ease of use of the Handy Backup to date I look forward to the all round, unified, in-one-package, solution I’ve just bought into." "I use Handy Backup for all of my businesses and personally. It is the best and only software I use for backups. Thank you for a great product." Handy Backup™ Small Server was awarded by PCMag in its small business backup software review.